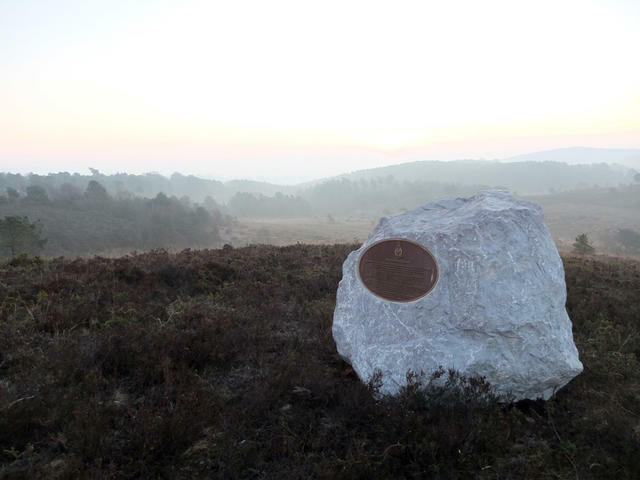 The Gibraltar Stone is a new memorial commemorating commando training in Devon - Royal Marines, Army and All Arms Commandos have trained on Woodbury Common near Exeter since 1940. The stone is an actual piece of the Rock of Gibraltar, donated to the Royal Marines by the people of Gibraltar in 2014. This donation marked both the 350th anniversary of the creation of the Royal Marines in 1664, and the 300th anniversary of the capture of Gibraltar by British and Dutch Marines in 1704. The Memorial is located in the heart of Woodbury Common, on land owned by Clinton Devon Estates; it can be visited by the public. The Memorial is on the ridge between Peter’s Pool and the Water Tunnel (GR038859), overlooking the old World War II firing range and part of the ‘Endurance Course’. 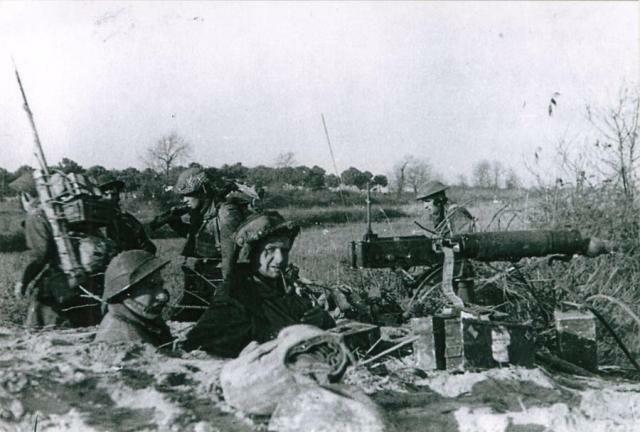 Early in 2014, the year of the 350th Birthday of the Royal Marines, it occurred to me that there was no memorial on Woodbury Common to mark the fact that thousands of Royal Marines, Royal Marines Commandos, Army Commandos and All Arms Commandos have trained there since 1940. 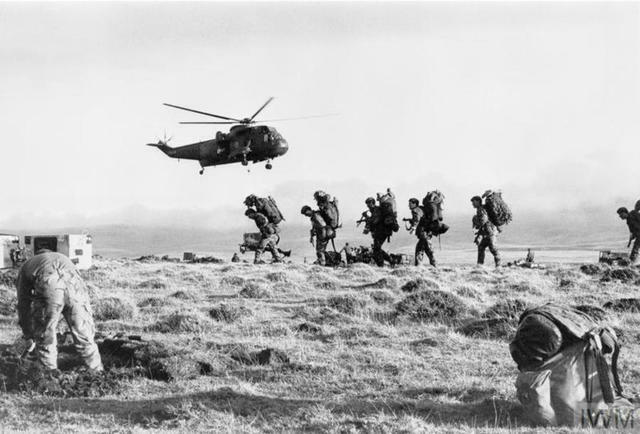 Surely all the men – and now a few women - who have trained there and served their Country so well, and the great support they have received from the local population, deserved some mark of recognition? By happy coincidence, in 2014, an ex-Commandant General of the Royal Marines, Lieutenant General Sir James Dutton KCB CBE, was serving as Governor of Gibraltar. Once he had been made aware of the idea, Jim Dutton approached the Chief Minister of Gibraltar, the Hon Fabian Picardo QC, with a request for a donation of stone for the memorial. The Royal Marines have a very close historical connection with Gibraltar, having captured it in August 1704. So General Dutton’s request also marked the 310thanniversary of that battle. Weighing in at just over 4 tonnes, and approximately 1.5 metres in height, width and depth, this boulder had, some years previously, fallen from the cliffs of the Rock of Gibraltar above Catalan Bay. Its natural, pyramidal shape mirrored that of the Rock itself, and the white colour of its limestone provided the ideal background for bronze plaques. With the help of members of the Gibraltar Regiment and Gibraltarian Environment Agency, the stone was collected and handed over to Royal Air Force movement staff in Gibraltar. They were able to put it on one of the C130 Hercules training flights which regularly visit Gibraltar, and it was delivered by them to RAF Brize Norton in the Oxfordshire. In the meantime, Clinton Devon Estates, the landowners of Woodbury Common, had been approached to see if they would provide a site for the stone on the Common. 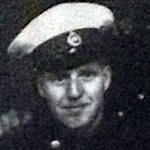 In recognition of their long-standing relationship with the Royal Marines, and with strong personal support from the current Lord Clinton, outline permission was readily given. At the same time it was clear that environmental concerns would need to be addressed. Woodbury Common is a designated SSSI (Site of Special Scientific Interest) providing habitat for important endangered species such as the nightjar, southern damsel fly and Dartford warbler. Dr Sam Bridgewater, the Nature Conservation Officer at Clinton Devon Estates, worked with the project to provide the necessary environmental impact survey and to get approval for the siting of the stone from Natural England, the regulatory authority. The stone itself had meanwhile been moved to South Wales where Mossfords, a firm of stonemasons specialising in war memorial restoration, had agreed to design, source and mount the bronze plaques at ‘cost price’ – an extremely generous offer of support for the Royal Marines. Working with the CEO of Mossfords, Simon Morgan, and the RSM from the Commando Training Centre Royal Marines, WO1 Phil Gilby RM, we designed and ‘word-smithed’ two plaques for the stone. The first plaque describes the purpose of the memorial and what can be seen from its location. The view from the chosen site (Grid Ref SY038859) takes in both land and sea, reflecting the Corps’ motto: ‘Per Mare, Per Terram’. It also looks over some of the abandoned WW2 training facilities, notably an old rifle range and, in the trees beyond, the area once covered by Dalditch Camp. On the hillside immediately below the memorial the modern day Endurance Course passes close by. This six mile endurance challenge runs across the Common through tunnels and other obstacles. It has to be completed against the clock by anyone wishing to qualify as a commando and gain the coveted green beret. From the memorial one can see two of the Endurance Course obstacles: Peters Pool and the Water Tunnel. 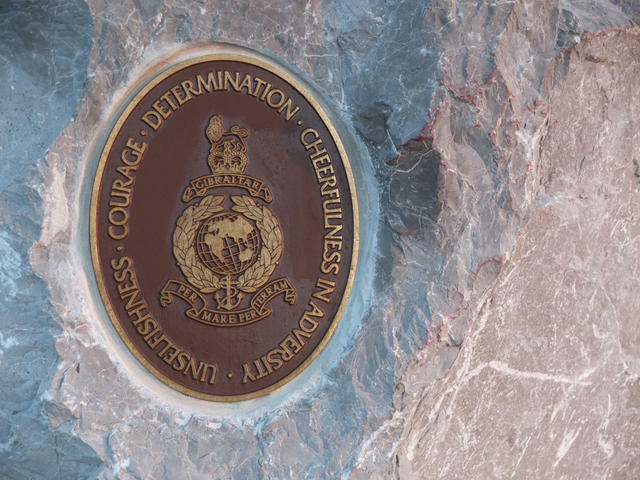 The second plaque has on it the Royal Marines Crest, the Globe and Laurel, surrounded by the four key attributes expected to be displayed by a commando: Determination, Courage, Unselfishness, Cheerfulness in Adversity. These four qualities are the glue that binds commandos together, giving them their unique ethos or ‘commando spirit’. This smaller plaque faces one of the hills on the Endurance Course and it will be seen by every recruit and officer under training as they complete that part of their commando course. By the end of 2014 the stone had been finished by the stonemasons in Wales and was moved to the Commando Training Centre Royal Marines (CTCRM) at Lympstone in Devon. CTCRM is the modern day centre of excellence for all Royal Marines and other arms commando training. It occupies the same site as the original RM Depot camp, built in 1939 for this purpose on the side of the River Exe estuary between Exton and Lympstone. 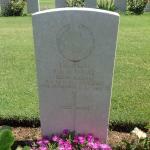 CTCRM will act as custodians of the stone on behalf of the wider Corps of Royal Marines. In February 2015 CTCRM moved the stone to its new location on Woodbury Common. The challenge of moving and placing the stone in its new home was undertaken by Royal Marines Assault Engineers from CTCRM, with vehicle and logistics support provided by the Commando Logistic Regiment. In the longer term, the memorial will be looked after and maintained by the Commando Training Centre Royal Marines. All enquiries may be directed to them at 01392 414011.